Posted on 27, March 2019 by EuropaWire PR Editors | This entry was posted in Automotive, Electronics & Machinery, Germany, Industrial, News, Sweden, Technology and tagged 3D printer, 5G, 5G standard, 5G-ACIA, AI, Andreas Müller, APAS, AQUIAS, artificial-intelligence, autonomous transport, BigRep, Bosch, Bosch Industry 4.0 solutions, data transmission, Factory of the Future, greater productivity, Hägglunds, Hannover Messe, high-performance hydraulic systems, Inclusion, Industry 4.0, Kiruna, LKAB, machine learning methods, machines, Mellansel, Nokia, Qualcomm, Rexroth, robotics, Rolf Najork, Sweden, ViPAS, visual quality control. Bookmark the permalink. STUTTGART, 27-Mar-2019 — /EuropaWire/ — Bosch will be presenting an autonomous transport system, artificial intelligence (AI) based visual fault detection and 3D printing relying on 5G at Hannover Messe. 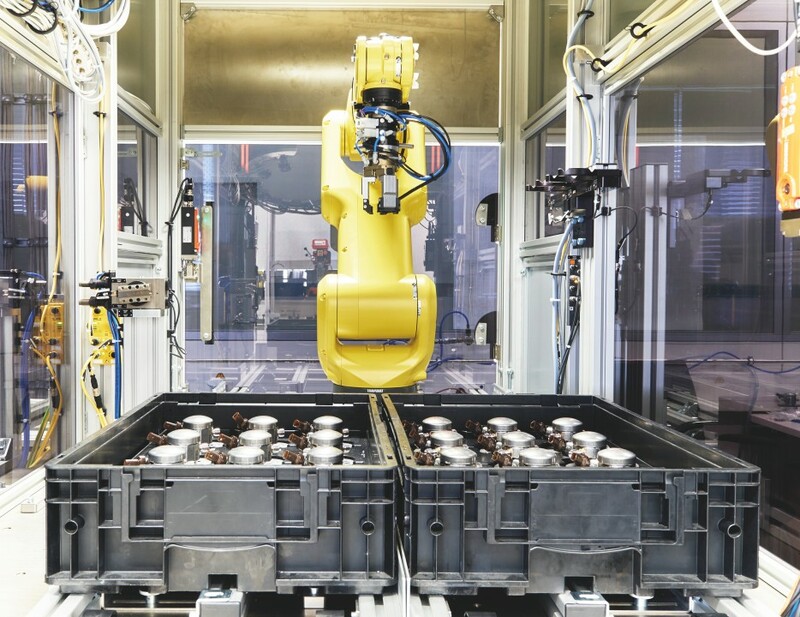 The factory of the future has already become a reality and the company is going to demonstrate that at this year’s Hannover Messe between Mon, Apr 1, 2019 and Fri, Apr 5, 2019. On display will be autonomous transport vehicles that deliver components to digital workspaces and then how robotics solutions are supporting workers in manufacturing while quality inspection is performed with the help of artificial intelligence (AI). Communication between machines and systems runs smoothly and in near real time due to the 5G. Industry 4.0 is a key enabler in the factory of the future. In fact, Over 1.5 billion euros is what Bosch has generated off Industry 4.0 applications over the past four years alone. Furthermore, the company plans to reach annual sales of over a billion euros with Industry 4.0 by 2022. According to Bosch, artificial intelligence (AI) is the key technology of the future. Relying on AI, machines can learn how to be smart and how to anticipate. People will be relieved from time-consuming and strenuous tasks as machines learn further, and this represents a huge potential. AI that is safe, robust, and explainable is what Bosch is focused on. Bosch’s AI-based system for visual quality control ViPAS will be demonstrated at Hannover Messe. ViPAS relies on a gripper arm, cutting-edge camera technology and an intelligent software. To illustrate what ViPAS is capable of, Bosch has tested the system in a pilot project at its plant in Nuremberg. The AI-based ViPAS system has gone through 12,000 test procedures achieving a success rate of 99.9 percent. The task was to sort the parts as “OK” or “not OK” and ViPAS has the job done with near-perfect accuracy. ViPAS will get further in-house refining to prepare the technology for use at various plants. Many Industry 4.0 applications are fully dependable on the new 5G mobile communications standard. The 5G allows data transmission of up to 100 times faster than the previous standard and as a result, transmission delays have fallen to a minimum while seeing its reliability significantly increased. To make sure that 5G meets the future needs of industry, Bosch has taken on the chair of the 5G-ACIA, which was established in 2018. Since then, over 40 key companies and research bodies have joined. Furthermore, 5G will be tested in Bosch plants before the end of 2019. The advantages of the new 5G standard will presented at this year’s Hannover Messe where Bosch will join its partners Nokia, Qualcomm, and BigRep. For the first time, Bosch, Nokia, Qualcomm and BigRep will bring connectivity to a 3D printer with the help of 5G. This set up will make it possible for some of the control elements that would normally be integrated into the machine to be outsourced to a local manufacturing cloud. Machines with this feature are leaner, cheaper, and easier to maintain. Sweden is of a strategic significance for Bosch. Sweden is this year’s Hannover Messe partner country. The company has been present in Sweden since 1904 and employs more than 1,600 associates at nine locations in the country. Bosch sales in Sweden are around 1.1 billion euros in 2018. In Sweden, Bosch connects its Hägglunds brand high-performance hydraulic systems with sensors and cloud-based applications, and employs machine learning methods at its Rexroth’s plant in Mellansel (eastern Sweden). The result is greater productivity and improved availability of the drive systems. Bosch Industry 4.0 solutions have also been put to work for LKAB at the iron ore mine in Kiruna, the northernmost city in Sweden.